Q: In Windows XP’s Paint program, you could select the little square box at the top, and then crop around the photo like you wanted. Can that be done in Windows 7? I can’t figure out how to do it in Windows 7’s Photo Viewer. 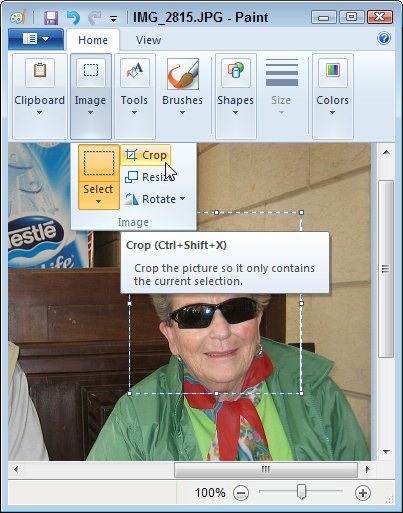 A: Yes, you can crop photos in Windows 7 using Paint. The problem is that you’re trying to crop using Photo Viewer, the Windows 7 program that pops up whenever you double-click a photo. Instead, you need to open Windows 7’s built-in Paint program. Beware, however; Windows 7’s Paint program comes with a new menu system known as the “Ribbon.” Love it or hate it, the Ribbon menu takes some time to figure out. Open the folder containing your image. Right-click the image and choose Open With from the pop-up menu. Select Paint; Paint will open and display your image. In Paint, click the Image menu, then choose Select. Click Crop from the Image menu; Paint quickly trims away everything except the area you selected in Step 5. Tip: Paint’s Crop tool works well for grabbing head shots for Facebook profile photos.